We are a dedicated crew of culinary explorers that meet at a different restaurant each month. Our mission is to eat and survey these restaurants; gathering recommendations, suggestions and opinions from restaurateurs about what food they would prepare on Mars. Each dinner we are joined by an expert who has insight into related fields: spaceship permaculture, micro-horticulture, space nutrition, culinary anthropology, and more. The series will culminate in a Martian cook-off. 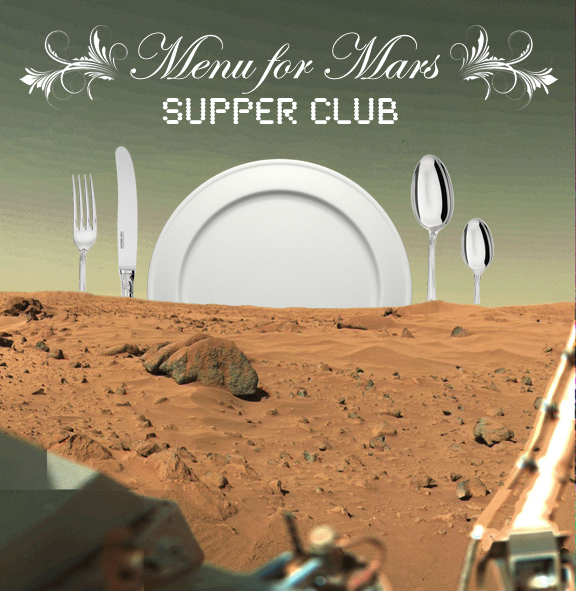 The supper club’s collected and summarized dinner findings will be made available to NASA, the Chinese Space Program, the India Mars Mission, the Mars One endeavor, and other people engaged in planning Mars colonization. At the end of the series, we will celebrate with a cook-off. In the Flux kitchen, guest chefs will cook meals suitable for Mars for a panel of outer space professionals. [EXPAND Mission #2: Thursday, June 5th 2014, 8pm.] Cuisine: Dim Sum + bugs. [EXPAND Mission #3: Saturday, June 7th 2014, 1-3pm.] Cuisine: Meal Replacement Picnic. [EXPAND Mission #4: Thursday, August 21st 2014, 7pm.] Cuisine: Moonshine. [EXPAND Mission #5: Tuesday, September 16th 2014, 7pm.] Cuisine: Russian. [EXPAND Mission #6: Wednesday, October 22th 2014, 7pm.] Cuisine: Ethiopian. [EXPAND Mission #7: Sunday, January 18th 2015, 7pm.] Cuisine: farm-to-table.Location: Upper West Side. Date: Saturday, February 23rd, 6 – 8 pm Cost: free for the entertainment! $5 for a sampling of food! Delight in the culinary talents of our Artists-in-Residence while celebrity judges Paddy Johnson, Steven Stern, Harriet Taub, David Shapiro, and Tracy Candido determine the ultimate Flux Iron Chef.